HAVANA - President Recep Tayyip Erdogan began talks for bilateral cooperation with his Cuban counterpart Wednesday at the Cuban capital of Havana, the second stop of his Latin American visit. Earlier, Erdogan visited the monument of the Cuban national hero, Jose Marti, and laid a wreath after national anthems of both nations were played. Cuban President Raul Castro welcomed his Turkish counterpart at an official ceremony at the Cuba’s presidential office. The Turkish and Cuban delegations were expected to move to a luncheon meeting following their delegation-level meetings. Foreign Minister Mevlut Cavusoglu, Economy Minister Nihat Zeybekci, Food, Agriculture and Livestock Minister Mehdi Eker and Culture Minister Omer Celik are part of the Turkish delegation. Erdogan and his delegation arrived in Havana Tuesday. Cuban Ambassador to Turkey Alberto Gonzales Casals had told AA that Turkey and Cuba were expected to sign a cultural agreement. "The culture of Cuba is very well-known in Turkey. Turkish culture is renowned in Cuba. We have much to develop in tourism," Casals said. Also, Turkey's Ambassador to Havana Hasan Servet Oktem had told AA that Cuba's need for foreign capital was on the rise and the country was expecting investors from Turkey. "Turkey and Cuba have close relations and Erdogan's visit will contribute into expansion towards Latin America," Oktem had said. On Sunday, Erdogan departed from Istanbul for Colombia, Cuba and Mexico, the first visit of a Turkish president to these countries. This is the second visit of a Turkish high level delegation to Latin American countries, with the first held in 1995. Erdogan's talks during the visits would focus on regional and international developments, bilateral relations and signing cooperation agreements in different fields. 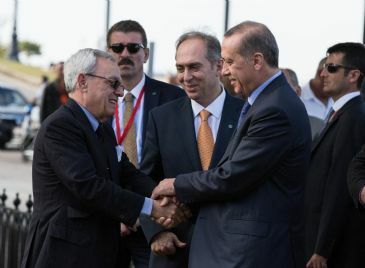 Erdogan arrived in Colombia’s capital Bogota Monday and was welcomed by President Juan Manuel Santos Calderon Tuesday. The two leaders held a joint press conference later on Tuesday and attended a signing agreement for a number of joint projects.